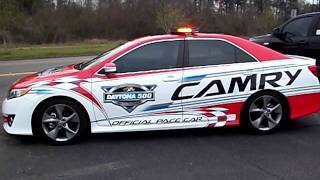 Toyota Camry will serve as the official pace car for the next year's Daytona 500 racing event, to be held on Feb 26 2012. At Daytona International Speedway, Toyota drivers have recorded eight NASCAR wins across NASCAR’s three national touring series, including one NSCS win (Kyle Busch in 2008), two NNS wins (Denny Hamlin in 2008 and Tony Stewart in 2008) and five NCWTS wins.In 2008, Hamlin claimed Toyota’s first-ever NSCS victory in a non-points qualifying event to determine the Daytona 500 starting lineup. 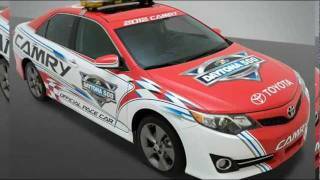 TORRANCE, Calif.(August 23, 2011) – Toyota Motor Sales, U.S.A., Inc. (TMS) and Daytona International Speedway (DIS) announced today the all-new 2012 Toyota Camry will serve as the official pace car for next year’s DAYTONA 500®. 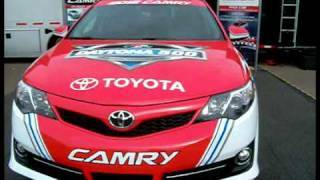 Toyota will showcase the new Camry -- the best-selling car in America for nine years running -- at Daytona in ‘The Great American Race,’ Feb. 26, 2012.The race annually kicks-off the NASCAR Sprint Cup Series season. Camry went on sale in 1983 and since then more than nine million have been sold in the U.S. Camry has been the best selling car in America for 13 of the past 14 years. This year marks the 25th anniversary of Camry production in Georgetown, Ky.Toyota began manufacturing the Camry in Georgetown in 1986 and the vehicle is now also built in Lafayette, Ind. The 2012 Camry debuts a bold, sophisticated new design with a more spacious interior, improved driving dynamics and an even quieter ride than before. The new model features class leading safety, fuel economy and multi-media technology. Toyota has previously provided pace vehicles at several NASCAR tracks, including Auto Club Speedway of Southern CaliforniaSM, Charlotte Motor Speedway, Chicagoland Speedway®, Dover (Del.) International Speedway, California’s Infineon Raceway, Kansas Speedway®, Martinsville (Va.) Speedway®, Nashville Superspeedway, New Hampshire Motor Speedway, Phoenix International Raceway®, Richmond (Va.) International Raceway®, Wisconsin’s Road Americaand Watkins Glen (N.Y.) International®. In 2004, Toyota began participating in NASCAR competition by fielding Tundras in the NASCAR Camping World Truck Series (NCWTS).Three years later in 2007, Toyota began competing in the NSCS and the NASCAR Nationwide Series (NNS) with the Camry. Toyota has won three consecutive manufacturer’s titles in the NNS (2008-2010) with the Camry, and Toyota racers have earned one driver’s title (Kyle Busch in 2009) and registered 60 race victories in the NNS.In NSCS competition, Camry drivers have earned 36 first-place trophies. In seven seasons participating in the NCWTS, Toyota has captured five consecutive manufacturer’s championships (2006-2010), and Tundra drivers have won driver’s titles with Todd Bodine (2006 and 2010) and Johnny Benson (2008), and have earned 88 race wins. At Daytona International Speedway, Toyota drivers have recorded eight NASCAR wins across NASCAR’s three national touring series, including one NSCS win (Kyle Busch in 2008), two NNS wins (Denny Hamlin in 2008 and Tony Stewart in 2008) and five NCWTS wins.In 2008, Hamlin claimed Toyota’s first-ever NSCS victory in a non-points qualifying event to determine the Daytona 500 starting lineup.